One action figure in a film often makes many people in the world inspired to pour in the form of his works. Only six years ago after serving a movie Stealth, a Northrop Grumman company recently rumored to have successfully developed a type of robot's first stealth fighter in the world and given the name X-47B. 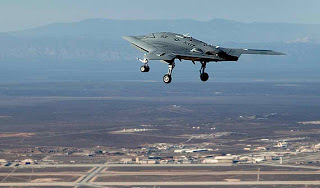 Robot-controlled stealth aircraft without crew, has successfully completed the appropriate test flight for 29 minutes above the altitude of 5000 feet and landed smoothly at Edwards Air Force Base located in California, USA. This type of robot X-47B is a top secret project company Northrop Grumman partnership with the United States Navy which has cost around $ 635 million, or about 6.35 trillion rupiah. Robots, unmanned jet aircraft has a range and greater power to perform the action takes off from an aircraft carrier, equipped with ammunition and bomb-controlled laser capable of refueling in the air. Airworthy test that has lasted more than a year this is an initial step to demonstrate the latest figures from the type of robot aircraft's first stealth fighter jet in the world. Investigate and prosecute have reportedly found a new type of robot will be used for military purposes in 2013 to come. X-47B is capable of flight with a top speed of "high subsonic", which he says is much faster than with UAVs like the Predator and Reaper aircraft that have been there before. Both wings of the aircraft-like wings kalelawar has a length of 62.1 feet (18.9280 meters), maximum-charged 4500 pounds (2 tons more), equipped with a number of sensor systems and a range of more than 2100 nautical miles (3379.6224 km). Even more great again, robot fighter jet can be controlled remotely (remote) or further programmed for purposes of a particular mission. Equipped with the ability to fly more than 40,000 feet, or about 12,192 feet, the robot can be used as spy planes or reconnaissance aircraft for the mission of intelligence, precision attack and detect ballistic missiles that exist. Prior to peberbangan tested using aircraft carriers, robotic aircraft is also scheduled to be there will be no additional flight test again at the Naval Air Station Patuxent River. In addition to this type of X-47B, there are reportedly still unmanned combat air vehicles that will soon follow the other tested the unmanned stealth fighter aircraft Taranis Britain. And reportedly will also be tested in the year 2011.